Play Lunar is the PUP that uses misleading techniques to prevent removal. Use Reimage to locate malicious components and get rid of them faster than with uninstall instructions. A full system scan blocks virus reappearance and prevents traffic to malicious domains. Is it worth installing Play Lunar on my computer? What distribution methods are used to spread this adware? 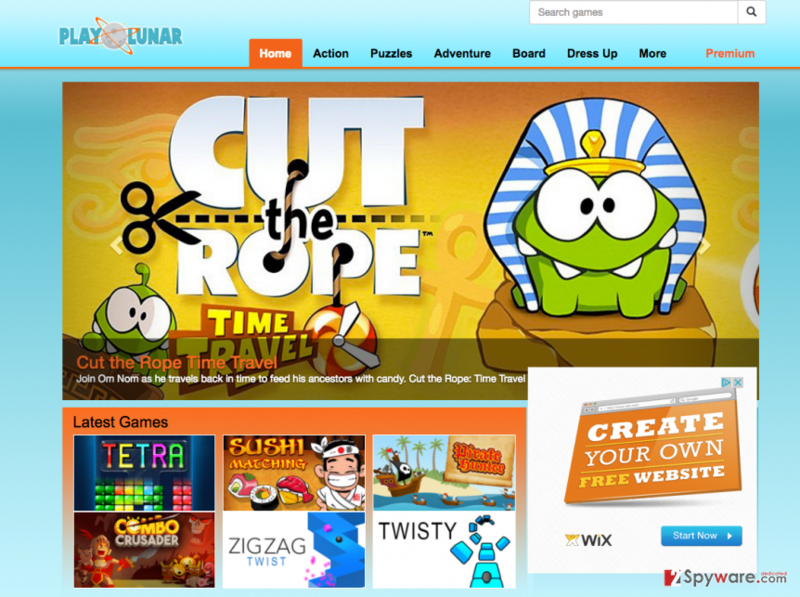 Play Lunar virus is an adware type application, which promises to let people play various games for free. Nevertheless, it can also start displaying different kinds of ads without restrictions. The main aim of this adware is to display “Play Lunar ads” that belong to third parties. No matter that the most of such ads is harmless, some of them may redirect you to potentially dangerous websites. To sum up, Play Lunar ads significantly diminish the quality of your browsing the Internet and the only way to get rid of them is to remove this adware from the system. Unfortunately, but Play Lunar goal is to generate pop-up ads, in-text ads, banners and any other type of ads with links to commercial pages is not the only one. This program can also redirect you to sponsored websites and even track your activity on the Internet. When Play Lunar hijack is finished, the adware starts gathering the NPII (non-personally identifiable information), such as user’s search queries, most visited websites and email address. This data is typically shared with third parties that are trying to generate more attractive and interesting ads for the user. Nevertheless, you can never know how trustworthy these parties are. If you have constantly been receiving ads while browsing the Internet, you should not waste your time looking at them. What is more, do not let these ads cover the content of your favorite websites! To protect yourself, you should simply remove Play Lunar virus from your computer. The most reliable way is to install Reimage and run a full system scan. If Play Lunar virus, in one or another way, infiltrated your computer, you have to remove it as soon as possible. You should know that it can be removed using manual removal guide, which is given below, or automatically. In this case, you have to install anti-spyware software, update it to its latest version and run a full system scan. If you are not experienced enough, you should opt for this removal method because manual Play Lunar removal can be difficult for you. To prevent the risk of leaving some data related to this adware on your computer, we advise you choose using the anti-malware software. It will not only remove Play Lunar or any other potentially unwanted program from your computer, but will also help you get rid of any data related to the malware. What is more, if updated regularly, this software will protect your computer from other viruses, malware and potential risks. Here, look for Play Lunar or any other recently installed suspicious programs. Wait until you see Applications folder and look for Play Lunar or any other suspicious programs on it. Now right click on every of such entries and select Move to Trash. When in the new window, check Delete personal settings and select Reset again to complete Play Lunar removal. Once these steps are finished, Play Lunar should be removed from your Microsoft Edge browser. Here, select Play Lunar and other questionable plugins. Click Remove to delete these entries. Now you will see Reset Firefox to its default state message with Reset Firefox button. Click this button for several times and complete Play Lunar removal. Here, select Play Lunar and other malicious plugins and select trash icon to delete these entries. Click Reset to confirm this action and complete Play Lunar removal. Here, select Extensions and look for Play Lunar or other suspicious entries. Click on the Uninstall button to get rid each of them. Now you will see a detailed dialog window filled with reset options. All of those options are usually checked, but you can specify which of them you want to reset. Click the Reset button to complete Play Lunar removal process. This entry was posted on 2016-04-27 at 03:44 and is filed under Adware, Viruses. You can quickly scan the QR code with your mobile device and have Play Lunar ads manual removal instructions right in your pocket. How did you remove Play Lunar ads?